Dr. Tobias “Toby” Capwell, jouster and curator with a PhD in fifteenth-century armour, is taking preorders for his forthcoming book on knightly armour in late medieval England. 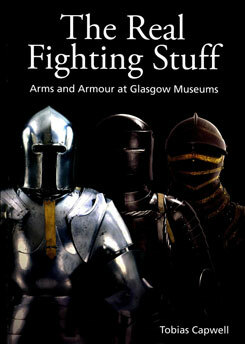 In honour of that, I thought I would post on the only one of his publications which I have been able to read, a book for beginners on arms and armour at the Glasgow museums. The Real Fighting Stuff begins by warning what a museum cannot show. Entropy determines that most surviving arms and armour before the nineteenth century are large metal objects. Swords and plate armour are very common in collections, but the bows, hafted weapons, and soft armour which once outnumbered them are almost entirely lost. Many collectors preferred to gather pretty things, and museums often reserve their limited display space for things which are pleasant to see, so arms and armour of ordinary quality often ended up on the scrap heap or in back rooms. Similar warnings are scattered across later pages of this book. The book is organized into units of 2-8 fully coloured pages on a specific topic with photos, paintings, and text intermixed. Many of these units focus not on a period or country but an area of life, such as hunting or jousting. Arms and armour were an integral part of life in many societies, and almost anyone interested in history would benefit from a basic knowledge of the subject. Catalogue numbers are listed in an appendix so that scholars can find other references to the same objects or ask about specific pieces when they visit the relevant museums. A number of sidebars and notes address misconceptions, such as the idea that the recesses running along some sword blades were “blood groves.” A nice touch is the comment that a suit of armour for war weighed about half as much as the kit of a modern soldier (p. 33); a hundred years ago Charles ffoulkes had to say that the weight was about the same, but since then more kit has been invented and military bureaucrats have become more punctilious about making every soldier carry every piece which might help. Having warned what surviving armour cannot tell us, Capwell then proceeds painstakingly through the arms and armour in Glasgow and show some of the things which they can tell the wise. Some of these are simple, such as repaired battle damage or changes which were made as fashions changed or the armour was mounted for display. One of the prides and joys of the collection is the armour of one of the Vogts of Matsch from about 1440, which the family sold in a moment of weakness. This armour has become the archetype of fifteenth-century plate armour, and a line drawing of it is often used to teach the names of the different parts of a suit of plate armour. Capwell relentlessly goes over this armour and discusses all the pieces which are missing or which were originally made for someone else. Rather than the traditional photo or line drawing with a frontal view, this book has a painting of how the armour might have looked shortly after it was delivered to its first owner. Capwell uses a similar strategy for the museum’s garniture which was made for Sir William Herbert in 1557. By the nature of things, a museum can only show one combination of parts at a time, and outer ones will obscure inner ones. A series of paintings lets the reader imagine the armour in different configurations and postures before its etched and polished steel had been darkened by rust and ignorant restorers. Dr. Capwell’s speciality is European armour of the fifteenth and sixteenth centuries, and this book contains some doubtable statements when it deals with much earlier or later periods. Greeks wearing glued linen armour appear (p. 8, 9) despite the absence of evidence for such a thing. I am surprised to see the equipment of Highland warriors in the seventeenth and eighteenth centuries described as “essentially medieval” except for their firearms (pp. 82, 86). Those firearms are a big exception, and the baskethilted swords which we associate with Highlanders today seem to have been invented not long before 1540. Some people might call the sixteenth century “medieval” but I do not think that any medievalist would. Other readers may frown as they read “the other type of sword popular in the eighteenth century was the ‘spadroon’- a broad-bladed cutting weapon. Also called ‘broadswords’ or ‘backswords,’ …” (p. 80: eighteenth-century Europeans knowledgeable about swords seem to have seen the spadroom as a weapon in between the slender smallsword and the versatile broadsword, and some complained [warning: video link] that they had the virtues of neither) Any broad book by a single author will have a few problems like this, and the quality of the units on Dr. Capwell’s passion more than makes up for them. Many books contain pretty pictures of arms and armour and a reasonably reliable commentary (as a child I enjoyed the Eyewitness History series). This book has better photos and more original comments than most, and by themselves they would make it worth its price. What sets this book apart is it first lays out the inevitable gap between the surviving artifacts standing in a museum and what once existed as part of a living culture, then tries to bridge the gap through painstaking examination of those artifacts and study of the culture in which these arms and armour were used. Whether one studies medieval amour or ancient tablets, these two things are what separates scientific history from scholasticism, and understanding the first will put a beginner much further ahead than memorizing a list of facts. Further Reading: Photos of the author in one of his blackened steel harnesses (research and craftsmanship by Tobias “Toby” Capwell, Robert “Mac” MacPherson plate-armourer, and Erik D. Schmidt mail-maker) are here. For an American study of the loads of US infantry in Afghanistan, see The Modern Warrior’s Combat Load; conversation with soldiers from other NATO countries gives me a similar impression.